We strongly discourage the use of products claiming to be self-cleaning logs for your chimneys. While these products may help to loosen the creosote buildup already in your chimney or over your flue, those creosote buildups are still there, and still as dangerous as ever. The next step after using these self-cleaning logs is either major house renovations due to fire, or chimney repair as soon as possible. Many of the house damages originating in chimneys are the result of creosote, sometimes blocking the flue, sometimes blocking the chimney before it can even get all the way up to the flue. The creosote blocks the pathway the smoke would otherwise be following to escape through the flue. Next, the smoke builds up, overflowing back into the room. If smoke overflows into the room for even 5 minutes, things will be permanently damaged. If the buildup happens close enough to the fire, the flames may even spill out and over into the room, setting your whole house ablaze. Have your chimneys cleaned before your house starts on fire. If the smoke does get misdirected at the top of your chimney, we offer services to clean the stains from the bricks it effected. There are three levels of creosote buildup that happen in chimneys. The first and second degrees are able to be cleaned without the help of chemicals loosening the composition of the buildup. Simply brushing it or using mechanical techniques will get rid of the layered creosote in those first two levels. When you get to the third level of creosote development, it takes more to get rid of the nuisance. 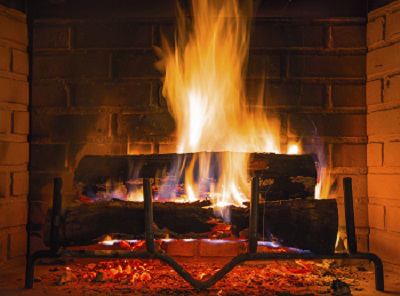 What the logs do is release a combination of chemicals up the chimney, altering the chemical build of the creosote to be a more brittle version of what was created from normal wood burning. This more brittle version of creosote can be easily cleaned from the sides of your chimney, clearing the blocked pathways for the smoke to escape. The problem with this is that most people don’t take the extra step of then cleaning off the brittle creosote from their chimney walls. Most people assume the log has cleaned the problem when, in fact, it hasn’t. It has only made the problem more manageable for the next person who cleans it. Wisconsin Chimney Technicians has been in business for over 30 years. We are a trusted source people contact when they need their chimneys serviced. Heck, we even clean the chimneys at the White House every year. Contact Wisconsin Chimney Technicians to have your chimney safely cleaned today.